I’m Dalene Bickel, author of the the Ink & Impact blog. The blog’s name was derived from my belief that our words matter; that sharing our experiences in written form can positively impact others. 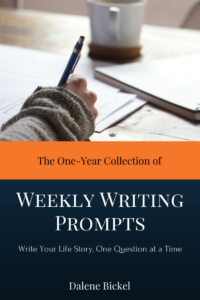 I created this forum as a way to discuss not only the craft of life story and memoir writing, but also to share inspiring stories of everyday people and learn about history through the lens of individual experience. I invite you to read through the blog posts and take advantage of the resources below. Like what you read? Be sure to comment and share with your family and friends. Have questions? Feel free to contact me; I’ll be sure to respond. Join the Ink & Impact FB Group! When I recently learned that October is National Bible Month, it prompted me to explore the historical relevance of the Bible not only within the United States, but also on a more personal level. The Bible has a long and important history within the United States, particularly within our government and judicial system. The Founding Fathers based the U.S. Constitution on the principles of the Bible. Every U.S. president except one (Theodore Roosevelt, during his first inauguration in 1901 at the home of Mr. Ansley Wilcox following the assassination of President William McKinley) has been sworn into office with a Bible, usually opened to a page containing a meaningful verse. And throughout the history of our country, individuals – prior to testifying in a U.S. court of law – swear to tell the whole truth and nothing but the truth as they raise their right hand and place their left hand on the Holy Bible. Occasionally, particular Bibles become historically significant. Consider, for example, the Durant Bible at the University of North Carolina at Chapel Hill. It was recently used as the Bible for the installation ceremony of the new chancellor, but its importance as a historical artifact is also signified by the steps taken to preserve the 414-year-old volume (see http://www.unc.edu/campus-updates/installation-durant-bible/). As important as the genealogical record is, I believe that there are other valuable connections between a family’s Bible and personal history. Simply remembering the appearance of the family Bible and how relatives used it can be relevant. For example, my great-grandmother read her Bible daily. It was a small, white, soft-leather Bible with gilt-edged pages and it had her full name monogrammed on the front in gold lettering. Although she kept it on her bedroom dresser, she always took it into the living room to read it in the comfort of her recliner (although I don’t ever remember her reclining while reading). Advanced in years, she often dozed off after awhile, almost always with one of her hands resting on the Bible’s open pages. As a child, I didn’t think much of her devotional time, but as an adult, I now understand that she helped to shape my spiritual journey by showing the importance of daily Bible reading. I wish that I possessed my great-grandmother’s Bible. I know that she recorded our family tree within its pages, but I don’t recall if she made notes in the margins of scripture. Many people have told me how important their family Bible is to them because of loved ones’ notations regarding a particular passage or verse. Those scribbled marginal notes benefit my friends’ understanding of the scriptures and simultaneously give them insight to the spiritual struggles and victories within the lives of their ancestors. Whether or not you currently own a family Bible, it is important to recognize that you can begin your own. Not only can you preserve your family’s genealogy, but you can also contribute to your family’s spiritual heritage. The great thing about personal history is that everything that happens to you is relevant to your life story. Take pets, for example. They provide innumerable moments of joy and happy memories, prompting some people to devote entire chapters within their memoirs to their beloved pets. I’m certain that my family could write several chapters about all of our pets through the years, as we have almost always had at least one pet. However, since the passing of our cockatiel a year ago and our cocker spaniel three months ago, we have been pet free. The boys are frequently asking for a new companion, of differing species depending on the week. The five-year old has asked for a fish and a frog. The eleven-year old would love another dog, but has also asked for a cat. The upcoming 4-H project involves a dozen incubated chicken eggs, but their father and I have put our foot down on keeping the eventual cute and fluffy chicks that will quickly turn into squawking, clucking, and generally annoying (and occasionally aggressive) hens and roosters (I know this from firsthand experience, but that’s another story). Although I truly loved our beloved and now-deceased pets, I must admit that I do not miss the scattered birdseed and rogue feathers, nor do I miss the incessant and futile vacuuming required as the owner of a dog with black fur. I have actually been enjoying the pet reprieve and am not in a hurry to replace them. It never occurred to me that perhaps an animal would make the decision to become our pet on its own. As I drew back the dining room curtains the other morning, I was startled by movement near the top of the curtain rod. 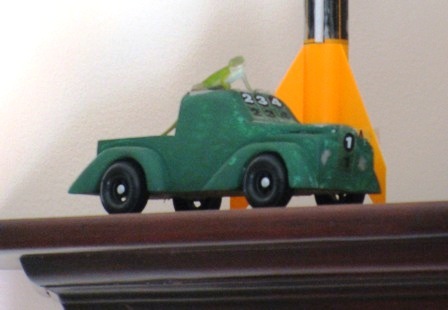 Glancing on top of the china cupboard, I was met by the intense stare of a green lizard as he sat perched on one of my son’s trophies. Not daunted at all by my immediate order to get out of our home, he merely jumped onto the side of my son’s model rocket. Amazed that the creature had not knocked over the lightweight rocket, I grabbed my camera (see photos below). I couldn’t resist the chance to take some photos of him – after all, how often does a lizard pretend to blast off into space? He didn’t mind the photo op; in fact, I think he posed for it before meandering across the top of the cupboard. I wasn’t sure what to do. Not generally a fan of reptiles, I do think the little chameleon-like lizards native to our coastal home (Green Anole – Anolis carolinensis; they change from green to brown, depending on their surroundings) are cute. However, they’re not cute enough for me to want to hold one, and certainly not adorable enough to reside inside my home. Of course this occurred while my children – who love to catch and play with the things – were at school. 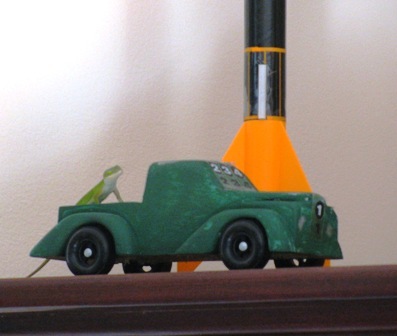 As I pondered what to do, the impudent lizard decided to go for another joy ride. He climbed onto the bed of my youngest son’s derby truck and simply stared at me. Then he climbed onto the roof of the truck, as if perhaps that would make him go faster. After taking a few more pictures, I turned to place the camera on the counter. Turning back around, I no longer saw him. That was two days ago. I have not seen the lizard since. I hope that he managed to find a way outside and is not galavanting around different rooms in my house, proud of his new abode. I’ll keep you posted if I see him again. In the meantime, please share your own wildlife stories – I would love to hear what has happened in your household! Entering into the fourth week of the new school year, I finally have time to return to my blog. The flurry of end-of-summer activities and back-to-school preparations somehow always catch me off guard. This year, I had to double my efforts as my second child officially entered the school system. As is customary for many children, my kids were filled with both excitement and trepidation on that first day of school. My oldest was excited only for the fact that he would be seeing his friends every day. My youngest was eager to be a “big” kid and see firsthand what “real” school (apparently, preschool did not count) was all about. I planned to provide them with a great breakfast, get them there before the masses arrived, and take Pinterest-worthy photographs of their big day. In reality, I overslept, fed them cold cereal, and broke the speed limit only to stand in line with a throng of other highly stressed parents and children as we endured the new security procedures. As for my post-worthy photos, I had to be content with a sour-looking expression from my oldest and a partially blurry image of my youngest as he moved with the crowd into the school. Despite my failures and the chaotic start to their school year, they are enjoying it, making new friends, and they are creating memories. That realization got me to thinking about my own school memories. I do not vividly recall my very first day of school (not until college, anyway), but I do remember many other things. My education began with half-day kindergarten where making cottage cheese and playing instruments in music class come to mind. Elementary school was filled with wall-mounted pencil sharpeners, cleaning chalkboard erasers, cherry-bumping kids on the teeter-totter, spelling bees, learning multiplication facts in fourth grade, learning to play the clarinet, and being startled by the sudden THWAK of a serving spoon (wielded by the cafeteria monitor) hitting a lunch table to subdue the din caused by all six grades of students at one time in a combined gymnasium and cafeteria. As for high school, I loved it. There are so many memories, I could write an entire book about them. Thus, when my personal history clients are having a difficult time knowing where to start or what to talk about, I often recommend discussing their school memories. No matter what their experiences – whether good or bad – they remember a great deal about their school years. That one topic includes a variety of categories (i.e., friends, teachers, rules, transportation, meals, discipline, sports, and classes) that can then lead to deeper discussions about the society and events of that particular era. What about you? What are some of your school memories? Share them here in the Comments section, and be sure to document them privately for your family as well. I recently participated in The Memoir Network’s teleclass, “How to Find Your Images and Metaphors,” taught by the organization’s founder, Denis Ledoux. As he noted, a memoir or personal history should not only provide the facts (who, what, when, where), it should also convey emotion. It can be fun to perform research, make discoveries and accumulate facts, but let’s face it – a mere listing of events or names on a family tree can make for some very dry and less-than-stimulating reading. Make the characters come alive by infusing emotion into the story, and don’t be afraid to expand the setting and action. This can be achieved by utilizing vivid descriptions (imagery) and comparisons (similes and metaphors) to better create a mind picture for the reader. My father, a volunteer fireman, was frequently summoned by the town’s fire siren. My father, a volunteer fireman, was frequently jarred to attention and summoned by the sudden piercing wail of the town’s fire siren – a sound as mournful and chilling as the random coyote’s howl. Don’t worry about becoming too verbose – incorporate as much detail and description as you can. When precise words fail you, turn to metaphors and similes to help you convey the meaning, but try to avoid clichés. Be creative! Think of something new and out-of-the-box to engage the reader. Write whatever comes to mind – remember, you can revise and condense if necessary at a later time. Yes, adding emotion and descriptions will require extra effort, but it will culminate in a much more engaging and entertaining memoir. There’s something special about blowing the dust off the lid of a faded box and slowly removing its contents. Immediately, you are transported back in time as you decipher handwritten letters, gaze at black-and-white photographs, and carefully inspect random memorabilia. It is even more rewarding to look through those treasures with loved ones as they reflect on their past experiences. The problem is that such moments are themselves becoming things of the past in our fast-paced, technological and far-flung world. In today’s society, rather than taking the time to pen handwritten letters and cards, we opt to share our life experiences via social media outlets such as Facebook and Twitter and send e-Cards. Instead of ordering double prints and painstakingly labeling the back of each photo before mailing them to friends and family, we digitally upload and share our pictures on photo storage sites like Snapfish and Shutterfly. It’s instantaneous and, many might argue, still reflects the same amount of consideration toward the recipient. However, looking at something through a screen is a far cry from the sensory experience of actually holding an item in your hands. Take an old diary or journal, for example. Not only can you look at it closely at varying angles in order to decipher the handwriting, but you can touch it. You can feel the smoothness of the worn leather cover and the brittleness of the yellowing, stained pages. You can hear the gentle crinkle of the pages as they are turned and the soft whisper of an old photo or theater ticket as it falls to the floor. 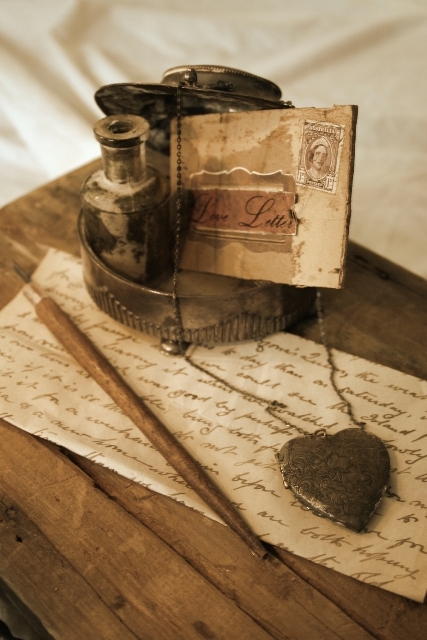 Depending on where the journal was stored or how old it is, you might detect the distinct smell of aging paper or even a trace scent of flowers from an old sachet. It is undeniable that the Internet and technology offer us much in the way of communication, but we all crave face-to-face interaction occasionally. This is especially true for the oldest members of our society. Oftentimes, seniors wish to talk about their experiences and share their learned lessons with loved ones, but this actually only takes place, if at all, at holidays or other family get-togethers. These tend to be stressful times when many are distracted by the meal preparations, the big game on TV and exuberant children on a sugar rush. It should come as no surprise, then, that my clients enjoy the dedicated one and two-hour intervals that we sit together; a time where they get to discuss, at length and uninterrupted, on the topics of their life experiences. Frequently, they get so excited about the process that they jot down notes in preparation for the next interview session, not wanting to overlook an important, amusing, or insightful event. If you are fortunate enough to still have living grandparents and/or aging parents, try to take the time to sit and listen to them. You may need to ask a few questions to get them started, but you will soon discover how easily they relax and begin to engage you in their stories. Take notes, record the session and enjoy the experience. It will be treasured by each of you, as well as your descendants. No one else can write a story about your life as accurately as you can. You know yourself better than anyone else. For example, family members probably know when you were born and married, and where you lived and worked. But unless they directly ask you, they will have no idea what your childhood was like or what you were thinking during your first job interview. Reflection often brings better understanding of past experiences. Celebrate your accomplishments, but discuss the difficult aspects of your life as well. When we are in the middle of a difficult situation, we’re often in survival mode – focusing on how to get through the ordeal. It’s only afterward, sometimes years later, that we come to understand the meaning of the situation and how we grew from the experience. In addition, reminiscence is a growing trend that in some cases can improve cognitive functioning, reduce depression and increase self-esteem. It’s a way to impart your morals, values, hopes and dreams to future generations. Facts are important and serve a purpose, but being willing to go beyond the basics to share your advice and beliefs will impact others in a much more meaningful way. Be honest – wouldn’t it be nice to know that future generations will get to know you as a person, rather than just another name on the family tree or some face in a photo album? You have a unique connection to the past. Social norms, geographical locations and popular trends helped to shape your life. 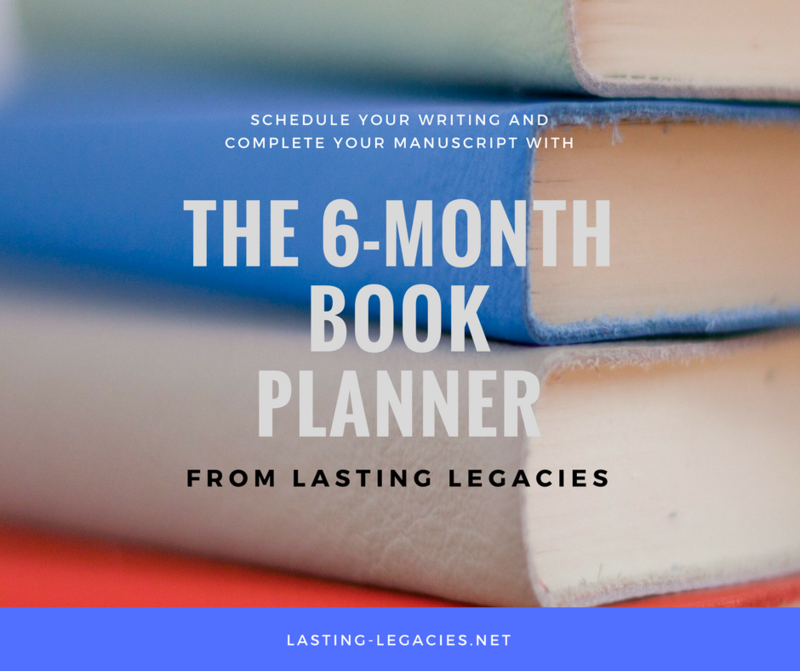 This is where photos, letters, memorabilia, recipes, awards and more turn your story into a one-of-a-kind historical artifact. You can become the link to the past for family members who are now deceased. Even though it may be too late to obtain a first-person interview with your great-grandmother, you can document your own memories of her and ask other family members to share their recollections of what she was like.